Gordon Fullerton, an Apollo-era NASA astronaut who was among the first test pilots to fly the space shuttle, died on Wednesday (Aug. 21), three years after suffering a stroke that left him partially paralyzed. He was 76. One of four astronauts who flew NASA's original prototype orbiter on atmospheric test flights, Fullerton launched into space twice. He piloted the shuttle program's third mission in 1982 and, three years later, was commander when an engine shutdown ended in the shuttle's only inflight abort. Fullerton followed up his 382 hours in space with 22 years of service as a NASA research pilot. Combined with his experience as a test pilot in the U.S. Air Force, Fullerton logged a total of more than 16,000 hours at the controls of more than 135 different types of aircraft, including NASA's B-52 heavy-lift airborne launch aircraft and the 747 Shuttle Carrier Aircraft. First trained as an F-86 interceptor pilot, Fullerton became a B-47 bomber pilot at Davis-Monthan Air Force Base in Tucson, Arizona. Fullerton was then selected to attend the Aerospace Research Pilot School (now the Air Force Test Pilot School) at Edwards Air Force Base, Calif., in 1964. Upon graduation he was assigned as a test pilot with the Bomber Operations Division at Wright-Patterson Air Force Base in Dayton, Ohio. It was Fullerton's test flight experience that led to his first spaceflight assignment. The Air Force selected Fullerton in 1966 to train as a crew member for its Manned Orbiting Laboratory (MOL) program. Three years later, when the reconnaissance space station was canceled before being launched, Fullerton transferred to NASA's civilian astronaut corps, where he first served on the support crews for the last four Apollo lunar landing missions. "I did the launch phase for Apollo [missions] 14, 15, and 16, and then on 17 I handed over, and then I went down and was the guy that closed the hatch [on the command module] for 17, the last one, because I wanted to see a launch," Fullerton recounted in a 2002 NASA oral history. "So that kind of closed out the program." Fullerton's first flight experience with the shuttle came as a pilot for the Approach and Landing Test (ALT) program in 1977. Paired with Apollo 13 pilot Fred Haise, Fullerton flew the prototype shuttle Enterprise for two captive and three free flights from atop the Shuttle Carrier Aircraft. "We were doing stuff that there wasn't a procedure for," Fullerton said. "We were writing the procedure and then flying it for the first time." The flights on Enterprise proved that a spacecraft could return to Earth as an unpowered glider, an ability Fullerton would help demonstrate on his first trip into space in a location that would be unique throughout the shuttle's 30-year history. Fullerton and commander Jack Lousma launched aboard the orbiter Columbia on March 22, 1982, on the shuttle program's third test flight. During the week-long mission, the two astronauts conducted the first loaded tests of the Canadarm robot arm and performed the first science flown aboard the shuttle. The STS-3 mission also marked the first and only time a shuttle landed at the White Sands Missile Range in New Mexico. Diverted from the Edwards Air Force Base where heavy rains left the dry lakebed too wet to support a safe touchdown, Lousma and Fullerton landed Columbia on the desolate Northrop Strip (later White Sands Space Harbor). Lifting off on July 29, 1985, the STS-51F mission carried 13 experiments in the fields of astronomy, solar physics and ionospheric, life and material science. Before any science could be conducted however, Challenger first needed to make it safely into space. "We show a center engine failure," Fullerton reported five minutes and 45 seconds into Challenger's ascent, nearly three minutes before any cutoff was expected. By burning the shuttle's two other engines longer, Challenger entered space but at a lower altitude than had been planned. The mission proceeded though, having conducted the first and only abort-to-orbit in the shuttle program's history. 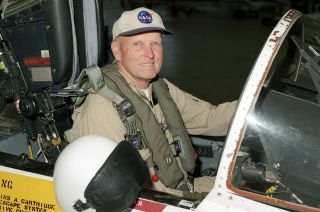 Challenger's landing marked the last time Fullerton would fly in space, but far from his last flight for NASA. A year after returning to Earth and in the wake of the 1986 loss of shuttle Challenger, Fullerton joined the research pilot office at NASA's Dryden Flight Research Facility in California. He became the project pilot on the NASA NB-52B launch aircraft, flying the modified bomber on the first six air launches of Orbital Sciences' Pegasus rocket, as well as flew the development flights for NASA's X-38 crew recovery vehicle and X-43A Hyper-X "scramjet" projects. NASA astronaut and research test pilot Gordon Fullerton, as seen with the crew of the NASA 747 Shuttle Carrier aircraft during its final ferry flight in October 2012. As a pilot for the DC-8 Airborne Science flying laboratory, Fullerton was deployed worldwide supporting a variety of research studies, including atmospheric physics, ground mapping and meteorology. He was also pilot-in-command on the first test flights of the Stratospheric Observatory for Infrared Astronomy (SOFIA), following the modifications to the Boeing 747 jumbo jet to integrate the observatory's 2.5-meter infrared telescope. Among Fullerton's other research assignments, he tested the drag chute for the shuttle and served as the pilot-in-command of NASA's Shuttle Carrier Aircraft on numerous flights that ferried the shuttles piggyback from California to the Kennedy Space Center in Florida. Fullerton retired from the Air Force as a colonel in 1988. He resigned from NASA in 2007. For his nearly 50 years of service, Fullerton was honored with numerous awards and medals, including the Air Force Distinguished Flying Cross, NASA Distinguished Service and Exceptional Service Medals, and both the Iven C. Kincheloe Award and the Ray E. Tenhoff Award from the Society of Experimental Test Pilots. Fullerton was also inducted into the U.S. Astronaut Hall of Fame and the International Space Hall of Fame. He is survived by his wife, Marie, and their two children.